If you’re just now hearing about the Trans-Pacific Partnership, don’t worry: It’s not too late to get up to speed. Negotiations over the huge trade agreement — which, when finished, will govern 40 percent of U.S.’ imports and exports — were supposed to wrap up this past weekend in Singapore, but, well, they didn’t quite make that deadline, which means meetings will likely continue into the new year. You’d also be forgiven for not hearing about it: The talks, as with all trade agreements, have been conducted largely in secret. Global health advocates, environmentalists, Internet activists and trade unions have deep concerns about what the deal might contain, and are making as much noise as possible in order to influence negotiations before a final version becomes public. Here’s what you need to know. 1. What is the Trans-Pacific Partnership? Basically, it’s a giant free trade deal between the U.S., Canada, and 10 countries in the Asia-Pacific region that’s been under negotiation for nearly a decade now (it began as an agreement between Singapore, Chile, New Zealand and Brunei before the U.S. took the lead in 2009). It’s expected to eliminate tariffs on goods and services, tear down a host of non-tariff barriers and harmonize all sorts of regulations when it’s finished early next year. 2. Giant, huh? How giant? 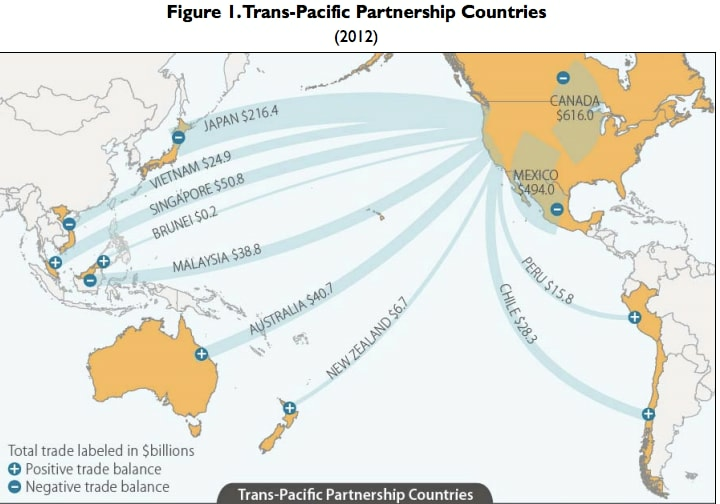 The countries currently party to the agreement — currently including Australia, Brunei, Chile, Malaysia, Mexico, New Zealand, Canada, Peru, Singapore, Vietnam, most critically Japan and potentially Korea — are some of the U.S.’ biggest and fastest-growing commercial partners, accounting for $1.5 trillion worth of trade in goods in 2012 and $242 billion worth of services in 2011. They’re responsible for 40 percent of the world’s GDP and 26 percent of the world’s trade. That makes it roughly the same size as the Trans-Atlantic Trade and Investment Partnership, another huge trade agreement that got rolling this past summer. The hope is that more countries in the region will join down the line. That’s right: China. The Obama administration’s focus on the TPP is part of its “pivot” to Asia — former national security adviser Tom Donilon called it the “centerpiece of our economic rebalancing” and a “platform for regional economic integration” — after too many years of American foreign policy being bogged down in the Middle East. Scholars such as Columbia University’s Jagdish Bhagwati are worried that the TPP goes further, as an effort to “contain” China and provide an economic counterweight to it in the region. Many of the TPP’s current provisions are designed to exclude China, like those requiring yarn in clothing to come from countries party to the agreement, and could possibly invite retaliation. In addition, 60 senators have asked for the final agreement to address currency manipulation, which wouldn’t directly affect China as a non-member, but could create a framework for broader action. 4. I thought we already had a World Trade Organization. 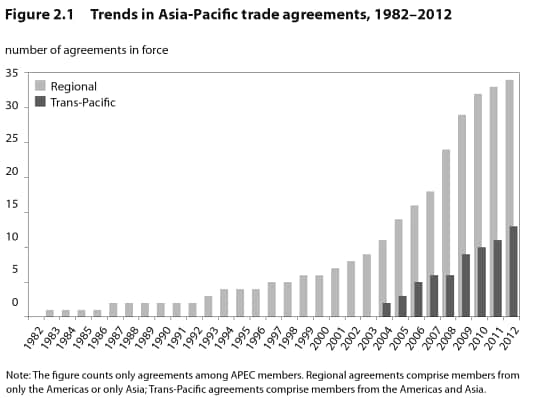 Why do we need a separate Asia trade deal? The TPP process itself is an admission that the consensus-driven WTO is too cumbersome a venue for so-called “high-standard” trade deals. The WTO’s weakness seemed even more apparent in its recent “breakthrough” on customs streamlining, which was all negotiators could salvage from the much more ambitious Doha Round that’s otherwise been a failure. Of course, some fear that another regional pact will just add complexity and undermine existing institutions. 5. How is it different from other trade deals we’ve done? Trade agreements used to deal mostly just with goods: You can import X number of widgets at Y price, as long as we know that certain environmental and labor standards are met. Modern trade agreements — including the Trans-Atlantic deal as well as the TPP — encompass a broad range of regulatory and legal issues, making them a much more central part of foreign policy and even domestic lawmaking. 6. Wait, so how much does this thing actually cover? The treaty has 29 chapters, dealing with everything from financial services to telecommunications to sanitary standards for food. Some parts of it have significant ramifications for countries’ own legal regimes, such as the part about “regulatory coherence,” which encourages countries to set up a mechanism like the U.S.’ own Office of Information and Regulatory Affairs to conduct cost-benefit analyses on new rules. USTR has a rough outline, and for a more comprehensive rundown, read this Congressional Research Service report. 7. That doesn’t tell me much. What are countries still fighting over? — State-owned enterprises: Many TPP governments, in particular Vietnam, Singapore and Malaysia, essentially own large parts of their economies. Negotiations have aimed to limit public support for these companies in order to foster competition with the private sector, but given the U.S.’ own government-sponsored enterprises — Fannie Mae, Freddie Mac, the U.S. Postal Service — they probably won’t go too far. — Market access: Though the treaty envisions dropping all tariffs, tensions remain between the U.S. and Japan over support for both of their agricultural sectors, as well as Japan’s willingness to accept U.S.-made automobiles. 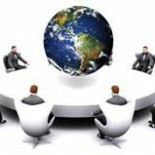 — Investor-state dispute resolution: Most modern free trade agreements include some mechanism for investor parties to sue governments directly for failing to abide by the terms of the agreement, which some public interest advocates worry will have a chilling effect on domestic regulation aimed at consumer and environmental protection. — Tobacco: Originally, the U.S. had proposed that tobacco be treated differently than other kinds of goods, in that countries would have permission to restrict its importation and sale. This summer, it executed something of an about-face, which alarmed anti-smoking advocates who worry that tobacco companies will continue to sue nations for passing laws that heavily tax cigarettes or ban certain kinds of advertising. The Peterson Institute has a helpful overview of some of the more contentious issues. 8. How do negotiations work, exactly? The negotiations have progressed in 20 several-day-long “rounds,” which rotate between the party nations. Typically, the U.S. will table a proposal or circulate something called a “non-paper” for discussion, which gets marked up by all the participants until they can come to a consensus. In between the rounds, the U.S. Trade Representative will brief its 16 formal “advisory councils” and seek input from key lawmakers on where they’ve arrived. (Given the robust revolving door between USTR and industry, a certain amount of back-channel lobbying goes on as well). When all the parties have agreed on a complete text, they’ll take it back to their respective legislative bodies for ratification. 9. 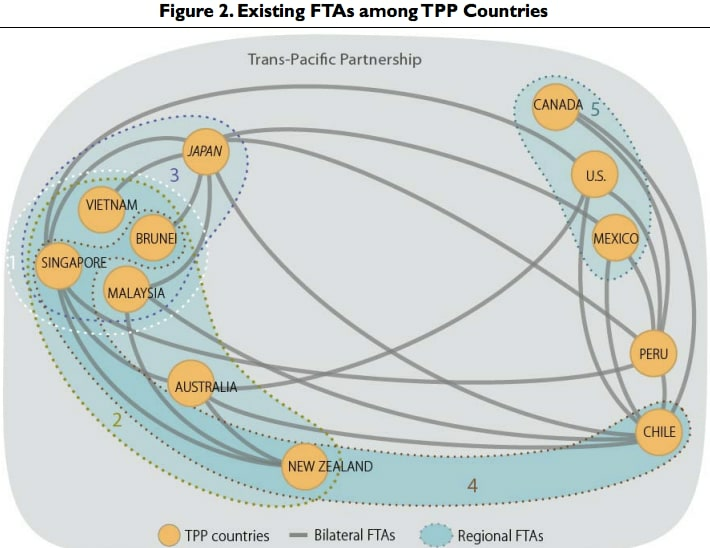 Why has the TPP been so secretive? Is that normal? What’s different this time is the scale and scope of the agreement, and the reasons advocates have had to be concerned about its contents. Sens. Elizabeth Warren (D-Mass.) and Ron Wyden (D-Ore.) have been particularly vocal about the administration’s refusal to make draft text available, as have law professors and numerous public interest groups. There have been a couple major unintentional releases, most recently in mid-November, when Wikileaks published a controversial chapter on intellectual property. 9. So but wait, how will this actually affect my life? To be honest, it’ll be hard to notice at first, and it depends on who you are. 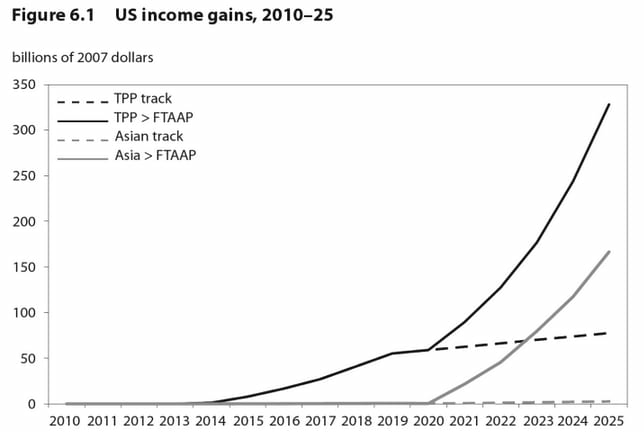 In the aggregate, it should make you richer: The Peterson Institute for International Economics estimates the U.S. will realize $78 billion more per year under its assumptions about what the TPP will include, and $267 billion annually if free trade is expanded to the rest of the Asia-Pacific region. Those gains won’t be evenly distributed, though: If you’re an investor or a U.S. business looking for foreign investment, or a small business looking to sell stuff overseas, the news is pretty great. 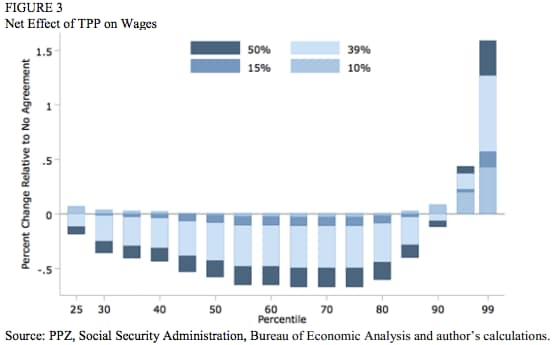 If you have a job making cars or airplanes, you might have reason to worry. (The Business Roundtable, which is composed of the U.S.’ biggest companies, has put together fact sheets on how it thinks the TPP could benefit each state). 10. What does Congress have to do with this? The Constitution charges Congress with giving advice and consent on trade agreements. Over the past couple decades, though, Congress has abrogated that right somewhat by granting the president something called “trade promotion authority” or “fast track,” which is the right to an up-or-down vote on the treaty as negotiated by the administration so as to avoid quibbling over line items that would require renegotiation with TPP countries. That’s what Congress is currently fighting over. Republicans and big business generally favor reauthorizing the president’s fast track privileges, which expired in 2007, while Democrats concerned with protecting U.S. industries and global health have opposed it or demanded more robust consultation up front in exchange. Without trade promotion authority, the chances of ratification are slim. Lydia DePillis is a reporter focusing on business policy, including lobbying, government contracting, and international trade, with a bit of urban affairs and infrastructure on the side. She was previously a staff writer at The New Republic and the Washington City Paper. Email her here and follow her on Twitter here. *Chủ đề: HIỆP ƯỚC THƯƠNG MẠI XUYÊN THÁI BÌNH DƯƠNG TPP & VẤN ĐỀ AN NINH TẠI BIỂN ĐÔNG do SBTN Úc Châu thực hiện. Kính chúc quý vị một đêm An Lành. This entry was posted on 06/02/2014 by lactanng in Cộng Sản VN, Chua phan loai, Hoa Kỳ, Việt Nam.